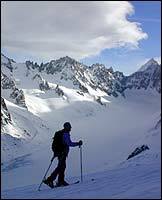 One of the several smaller resorts that make up the Chamonix ski area, Argentière is where most advanced skiers head to when they arrive. It's where the big guns go when they talk of the Chamonix domain. The Grands Montets offers some of the best and most difficult off-piste and black-piste skiing anywhere, but be sure to take a guide if venturing away from the marked trails. As with the whole Chamonix valley, the scenery is stunning. Skiers here generally aren't too interested in tans or gastronomic delights, but are lucky to have some of the best mountain eateries in the Chamonix area and down in the village, the Marti (in the old town by the Mairie) is world class if you miss your nouvelle cuisine. The nightlife's not bad either with the ever-popular Office Bar continuing to attract a lively crowd. Overall, Argentière is a true skier's resort with stunning scenery including the Baroque Church and a 19th century Chapel. 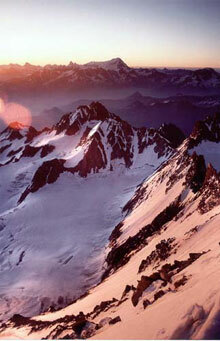 Argentière is a true skier's resort and part of the famous Chamonix ski valley.